You are currently browsing the tag archive for the ‘Philadelphia Lawyers for Social Equity’ tag. This morning, I took my eye off the prize. I succumbed to surface and to common narrative. “60-years ago today Rosa Parks sat on a bus, held a mirror up to a racist United States, changed history,” I tweeted. What I said was true … but it was reductive. And it was in fewer than 140 characters. For a moment, I settled. We need courageous historical moments as way-markers and inspiration in the ongoing fight for equality, and we mustn’t mistake them for job done or mission accomplished. What she started, we must still continue. “Social justice requires social action,” says Mike Lee, Executive Director of Philadelphia Lawyers for Social Equity (PLSE) an organisation with whom I am allied and who responded to my tweet by pointing out that since Rosa Parks was fingerprinted and booked into jail, over 70 million people have joined her in law enforcement and FBI criminal databases. Rosa Parks changed history but she didn’t heal all social ills. 70 million is quite the acumulation of permanent information. Quite a new order of magnitude in state control. Have the advances we’ve made in employment opportunity, and even educational opportunity, been met with anything close to equality within the machine of criminal justice? I don’t think so. Permanent records have permanent effects and debilitate people in their efforts to move forward in life with secure housing, jobs and access to social services. “It is estimated that one in five Philadelphians has a criminal record,” says PLSE which has, in recent years, expunged over 5,500 criminal records in Philadelphia County for 3,000 low-income individuals. PLSE conducted over 200 educational know-your-rights workshops about criminal records creation, dissemination and destruction. It has donated over $5,000,000 of pro bono legal representation and facilitated 900 hours of AmeriCorps community service in expungement hearing representation. PLSE settled two employment discrimination cases based on criminal history. Let’s honour Rosa Parks in a continuation of her fight for equal rights. Let’s act, not just talk. Do, not just ‘Like’. And perhaps today, on Giving Tuesday, Give? For the past 18 months, the Philadelphia Lawyers for Social Equity (PLSE) and the People’s Paper Co-op (PPC) have partnered in creating client art as part of the PLSE’s Criminal Record Expungement Project (CREP) clinics. While CREP lawyers, grads and volunteers are pulling up criminal records, assessing eligibility and triggering first steps of expungement, the PPC has been taking physical copies of those records and with clients, shredding and pulping them. New paper is made from old records, upon which clients write what they are and what their future is without the millstone of a record and its associated barriers to entry into work, housing and education. A Polaroid or digital snap of the client accompanies the testimony. Fantastic artistic strategy. The result is a massive “quilt” of such testimonies — a detail is shown above and the collection is shown below hanging behind a speaker addressing a PPC event. The People’s Paper Co-op has been selected to be part of the New Museum’s Ideas City Festival this weekend. It’ll be displaying the quilt and talking about the project. Representatives of PPC and PLSE will be in the PPC Mobile Studio parked in front of the New Museum tomorrow, Saturday May 30th, from 12-6pm. If you are interested in the intersection of art and legal advocacy on behalf of those with criminal records stop by!PPC and PLSE’s collaboration was one of 110 projects chosen to represent how artists are responding to changing urban spaces. I’ve sung the praises of PLSE before. PPC was co-founded by friends of the blog Courtney Bowles and Mark Strandquist. Below is a small selection of images from the workshops and PPC events that Bowles and Strandquist have carried out during their SPACES residency at the Village of Arts & Humanities in Philadelphia. PLSE and PPC’s work has been featured in Philadelphia Inquirer, Wall Street Journal, NBC and City Paper, to name a few. 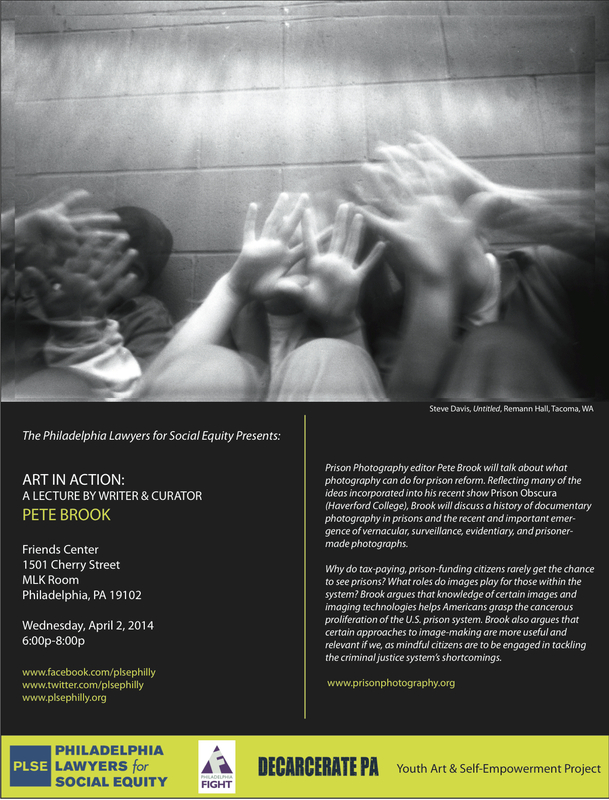 I am to deliver a lecture in Philadelphia on April 2nd. It is hosted by the Philadelphia Lawyers for Social Equity (PULSE) a wonderful group that advocates in many ways — one of the most impressive is with the pro bono Criminal Record Expungement Project (CREP). I’d like to introduce their work very briefly here. Last time I was in Philly, I sat in on an expungement clinic. On that day, Ryan Hancock, civil rights lawyer and co-founder of PULSE, estimated they filed approximately 1,000 dockets to the courts to begin the expungement process for clients — that equates to approximately $100,000 in legal services. Done for free. In just three hours! CREP clinics usually occur on Saturdays and are manned by banks of law grad students from a number of Philadelphia universities. Over the course of eight clinics, Hancock estimates PULSE has delivered nearly a million dollars of legal services. A rap sheet includes non-convictions as well as convictions. One’s right to have non-convictions expunged from a record is statute protected but not by definition a constitutional right. Rules differ state-to-state. Non-convictions included in databases perpetually hamper citizens from gaining employment and state services. Expungement should be a relatively straight forward filing but it can be expensive ($1,000+ legal fees per filing) and it is timely and bureaucratic with dockets moving very slow. CREP challenges this in their very procedures. CREP has written and adopted a software program that generates the dockets automatically cutting out hours — even days — of labour. This means they can help a greater number of people in a shorter amount of time and it also means they are testing the system by which the dockets are filed. By flooding the system, legally, with filings to which we all have legal right, CREP is testing Pennsylvania’s criminal expungement procedures. They monitor the progression of paperwork and identify bottlenecks in the system. The system will either break or it will adapt and achieve efficiency. Such a clever strategy. For many of the CREP clients, the expungement process is the first time in their lives they can ask a judge to meet their statute protected rights. For many, they’ve experienced a legal system in which they have little to no agency and so for a majority the expungement process is the first time they ask a court of law to serve their needs. Oh, and by the way, criminal record expungement helps all of society too. Come say high! It’s a the Friends Center on 1501 Cherry Street, Philadelphia in the MLK Room from 6-8pm.